Home > Rambling > What Is Rambling? Rambling has become a much more popular pastime in the UK recently with the Ramblers’ Association now boasting 140,000 members who regularly take part in activities across the UK. If you’re new to the idea of rambling, you might well be wondering exactly what it involves and how it can benefit you. Why Should I Go Rambling? Where Can I Go Rambling? You can go rambling almost anywhere where there is enough green space to do so. It’s not quite as straightforward as it sounds though, as you need to be aware of countryside access and Rights of Way (ROW). It’s best to stick to places that provide good walking networks - especially if you’re not an experienced rambler, as it’s all too easy to get lost if you’re not sure where you’re going! Here a few of the best places to look out for. National parks (NP): There are 14 of these situated across the UK. They offer well-signposted paths to guide ramblers. 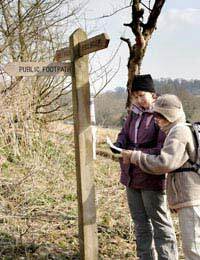 They are maintained by the National Park Association, although the public is free to use the designated walking paths. Famous examples include the Peak District and Dartmoor. Areas of Outstanding Natural Beauty (AONB): There are 40 of these across the UK. Famous examples include the Cotswolds, the Sussex downs and the Norfolk coast. Heritage coasts - Various beaches along the English and Welsh coastline are designated a Heritage Coast, including Beachy Head in Sussex and Dover. The Isle of Wight is a particularly good place for walking and rambling. National scenic areas (NSA) - There are currently 40 of these in Scotland. Loch Lomond is one of the most famous examples of an NSA. They are the Scottish equivalent of an AONB or Heritage Coast. Community forests - In England, these are located in 12 urban areas. Around half of English people are thought to live in or near a community forest, so this is a good option for rambling without having to travel too far from home. Regional parks - These are situated near big towns and cities. Rambling is a great activity for anyone who wants to increase their basic fitness, while getting some important health benefits into the bargain. You don’t need to be an experienced walker to go rambling - you just need to have a keen enthusiasm and a good sense of direction!